Chocolate Candy Bridal Shower Favors are a must for a girls night of celebration of the upcoming big day. You can choose your favorite chocolate party favor from the suggestions below. You can order up a selection at reasonable prices, or save even more money and make your own. 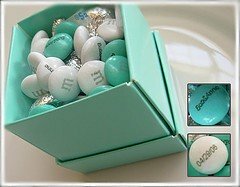 One of the simplest but cutest chocolate candy favors for bridal showers are M&M's that are customized with the names of the happy couple and their chosen wedding date. You can get them in colors to coordinate with your wedding theme, or just to match the theme of the shower if that is a different color scheme. Pick up the M&M's at My M&M's and then choose your presentation style. You could simply put a handful in a square of matching tulle and tie it up with a ribbon. Another idea is to get mini boxes or bags from Candyland Crafts, and fill them with the M&M's. Maybe you have something in mind already for cute chocolate candy bridal shower favors presentation. Go for it! Have you considered a personalized chocolate bar for your chocolate candy bridal shower favors? It is definitely something to think about. These custom candy bars make a clever chocolate party favor. There is a large selection of layout designs to choose from to suit your taste and color scheme. You can include a photo or personal details that will be a real keepsake for all of your guests. Check out the assortment at Memory Wraps and Candy Wrappers.com. If you love this idea as much as I do, you may just want to go ahead and order the software from Custom Candy Wrappers or The Dapper Wrapper and print out your own personalized wrappers any time you like. Hershey's kisses are another "sweet" but economical way to enjoy a chocolate party favor that everyone will love. They may be very basic, but when you get the personalized stickers to pop on the bottom of each kiss, it brings them up a notch in class. What could be more appropriate for a bridal shower than a bunch of kisses? You will find the stickers at Candy Wrappers.com. They will provide you with the personalized stickers, or even put them on the kisses for you for a little more cost. If you would like to assemble them yourself, you can find a selection of chocolate kiss flavors at Candy Warehouse. These are chocolate candy bridal shower favors that everyone will enjoy. 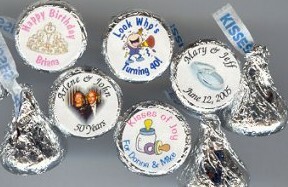 Much like the custom hershey's kisses, custom chocolate candy coins are a cute idea for a simple shower favor. 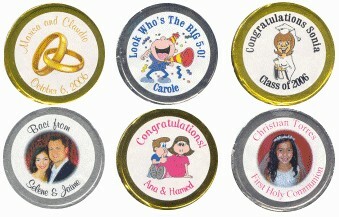 You can use the same stickers from Candy Wrappers.com and apply them to delectable chocolate coins. There are a lot of different sizes of chocolate coins as well as different color foil choices. You can get a good price and selection from the Candy Warehouse, and they have more than just chocolate. There's bubble gum coins, too, if you'd like to mix it up a bit. If you want to make your own chocolate candy bridal shower favors, browse through the recipes on this site and choose the one or two that really make your mouth water. You can easily whip up a batch of fudge, or truffles, chocolate popcorn, or chocolate covered peanuts or fruit. Once you have selected your recipe, you will find everything you need for packaging and presentation at one of my favorite providers of chocolate candy making supplies. Browse through their selection of supplies to stir up your own creativity. They have a tremendous selection of molds that might prompt you to make your own molded chocolate candy shower favors. You can choose from hearts, bride and groom molds, the traditional umbrella, or maybe something specific that relates to a particular interest of the bride and groom. Whatever chocolate candy bridal shower favors you decide on, I hope your party is a great success and an occasion for joy. Best wishes to the lucky lady!